General This contains the exact same content as in The Final Night Preview, but with the addition of color, and it is presented at a larger size (about double). 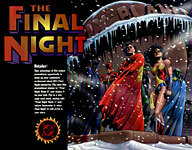 The cover art was seen on The Final Night Preview and on The Final Night #1. This calendar was designed to be displayed one double-page spread per week over the course of six weeks prior to the first issue of The Final Night. Each page thus represents a week of time, something not clear in The Final Night Preview. 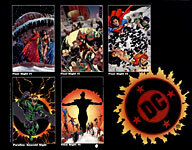 The Team 20 Legionnaires appear on the final page. Special thanks to Michael Grabois for providing this item.